My own builds, rev inspired. Kite Flying of course! And Kite Building. Photography. Music; both listening and composing (and performing a long while ago now). Abrasion is a common problem with the Rev LE Vertical Tabs caused by the vertical spars or end-caps rubbing against the Dacron tabs and eventually coming in direct contact with the LE spar. The B-Pro series kites have a piece of Kevlar sewn internally to this tab which prevents this problem. 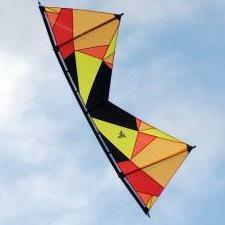 But what do you do if your kite suffers damage and does not have this nice pro feature? Introducing the Kevlar Band-Aid... It is a simple idea and is probably self-explanatory but I thought I would share how I repaired the damage to my kite in case it might help you. Here is the damage that occurred to my kite: To repair this damage I made a “Kevlar Band-Aid” from Dacron Tape, woven Kevlar, and a strong 3M adhesive tape. Here is the design followed by a picture of the Band-Aid: Note that the adhesive tape that I used is very strong and you only get one chance to apply it to anything, hence the Kevlar being slightly askew. Avoid touching it with your fingers. Apply the Band-Aid to the damaged area and clamp it for several hours. After the Band-Aid has been applied you will probably need to recreate the hole for the vertical end-cap shock-cord. I use a soldering iron or wood burning tool to do this... Applied Band-Aid and recreated hole Here is the completed repair: Your vertical spars probably have suffered some damage if this has happened to you. I labeled the damaged ends of my spars as “VB” (Vertical Bottom) to insure that I use these spars only for the verticals and place the worn ends at the bottom. From the picture it appears that there is a crack in one of the spars but this seems to be a crack in the “clear coat” that was applied to the spars. It would certainly be a good idea to have spares should a worn spar fail while you are in the field. I hope you find this useful. S.F. I was inspired by the information shared in recent posts regarding the existence of something called a "Nail Board" to help tie accurate "Knot Systems" such as bridles, leader lines for handles and potentially other applications. I decided that what I am about to share is too lengthy for a forum post so I have posted this as a blog instead. I hope you find it useful. SF Nail Board Instructions for Knot Tying A Nail Board consists of a “flat board” with physical markers defining the spacing between knots tied in a line for a specific purpose. “Bridles” and “Leader Lines for Handles” are good examples but there may be other line applications that a Nail Board can be used for. Summary: A Nail Board serves two purposes that provide an advantage to using a tape measure or rule for tying lines with knots that require precise and symmetric spacing: 1. The location of each knot can be consistently and accurately marked. 2. The line material can be pulled under light tension when making the marks using the physical markers. 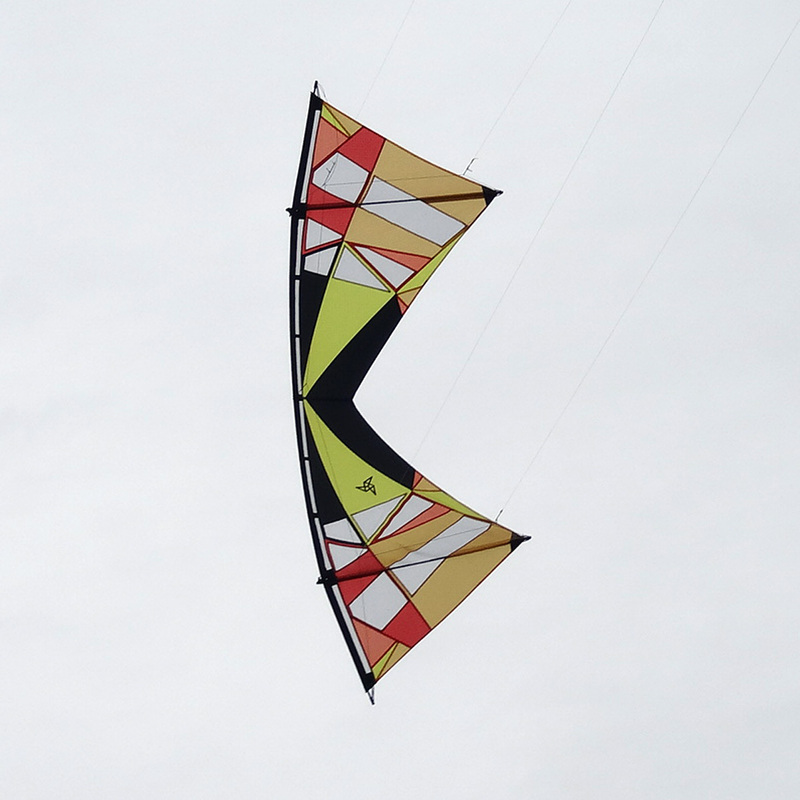 This allows the spacing of the knots to remain proportional when stretched during wind-loaded flying conditions. What a Nail Board does not do for you: You can’t tie single or multiple loops from the dimensions on the board; the dimensions on the board are “final” dimensions of the “knot system” you are tying. Prior to tying looped knots you must determine the length of line that is required to tie the loops, or other knots, to fit the final dimensions of the physical markers on the Nail Board. Details: Knot Tying vs Knot Marking. The process of tying the knots is separate from the marking of their location. Each type of line material has a specific diameter and each knot and type of knot takes a specific length of line to tie. This must be determined beforehand. The actual line required to tie a knot system is defined as: Line spacing defined between the knots + “length to tie” for all knots in the system. Calculating the length of your line to tie a loop knot (“Length to Tie”): Mark a 12” length of the line with which you will be tying a knot. Call this “D1” Note: in the picture I used blue tape as a mark only for the purpose of illustration. I use a white “cloth marking pencil” to make my marks which does not show up well in a photograph. Tape is not a good material to use for marks since it can slip on the line while tying. Tie the specific knot that you will be tying. I have used an overhand knot for this example to form a loop. The marks that you previously made should be behind the knot by ~1”. The marks should match each other below the knot. Make sure that the knot is “Well Formed”. All lays are parallel with each other as the knot is formed; no crossing between the lays. Pull the knot taught with force after tying; I use my forceps in the top of the loop and pull very hard on the opposite end. Now measure the distance from your marks to the top of the loop. Call it “D2” Length to Tie = D1 – 2 x D2 . this will be the “Length to Tie” for this line and this loop knot. The length to tie a loop per knot for my material is 1 1/8” believe it or knot (100# bridle line) Here is an example: In this example there are two loops. The total length of the knot system is 3” (2 ¼” + ¾”). The length of line required without knot consideration is 6”. There are two knots in this loop system, one at the bottom and one towards the top, which will take 1 1/8” each for my line material. The total length of line to tie both knots in this system is 6” + 1 1/8” + 1 1/8” = 8 1/4”. For a single knot (not a loop) in a line the “Length to Tie” is simply: Length to Tie = D1 –D2 after you have performed the same experiment with a single knot in one line. How to use the “Length to Tie” The “Length to Tie” must be added to the line dimensions when you are tying your knots. After they are tied, they should fit back on the Nail Board and be under slight tension. Conclusion: Following these procedures and using a Nail Board should result in very accurate knot placement for your projects. When tying more than one identical knot systems, they will end up being perfectly symmetric. Materials and tools required to make "my" board are: #18 x 3/4” wire brads. 36” x 5 ½ x 3/4” Pine Board (premium grade, flat, actual measured dimensions shown) Drill press with depth stop capability (not required but adds precision and protects the drill bit). 3/64” drill bit (available for Dremel tools or other sources) Long Straight edge rule 4 ft (for drawing straight lines on the wood) Tape measure for measurements of marker placements. Thanks riffclown You have inspired me to think about your process for tying knots and designing my own jig. I will let you all know how it turns out... I will also share a picture of my jig when I am successful. I am very accurate with tying and spacing my knots under tension using a rule and marking the knot tying points but it is very tedious. And matching identical knot assemblies such as a bridle or leader requires some adjustments afterwards if there were slight errors. Perhaps the jig can make my process more consistent. 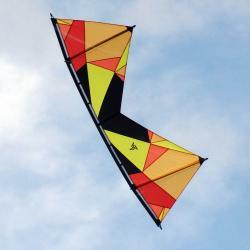 How about the "bird-cry" sound your kite makes occasionally in just the right wind conditions?